I wasn't always a gamer. Although I spent much of my childhood clutching 8-bit console controllers and dumping paper route income into arcade cabinets, in my early teens I lost interest in games. In fact, during the formative years of my early adulthood, from 15 to 25, I hardly played games at all. I blame my father, at least to an extent. He was a college art instructor. When, as a typical adolescent, I found myself casting about for meaning in the world I found it the same place he did: the arts. I turned away from the pixelated imagery of late 1980s games and toward the sumptuous, intoxicating beauty I found in art books and museums. Games still interested me, but they seemed crude by comparison. Unfortunately, I didn't inherit my father's artistic gifts. I couldn't draw, paint or sculpt as he could. But, as I discovered near the end of high school, I could take photographs, and I took to the darkroom like a fish to water. I learned to love the amber glow of the safelight and the smell of the chemicals in which my prints soaked. In college I landed a TA position that gave me 24-hour access to the university darkroom. I spent years obsessed with the hobby, blissfully ignorant to the rise and fall of the 16-bit console era and the golden age of the adventure game. College ended, though, and with it my artistic aspirations. I landed a solid day job that left me with little time to take or print pictures. The further I pursued the hobby, the more expensive it became. A marriage, mortgage and child later and photography just didn't fit my lifestyle anymore. I needed a new hobby, one that didn't take me away from home. In the late 1990s I bought my first new PC, after subsisting for years on my parents' hand-me-down Macs. Not long after, I stumbled into a gaming store to see what my computer could run. I followed the clerk's advice and walked out with a copy of Half-Life. 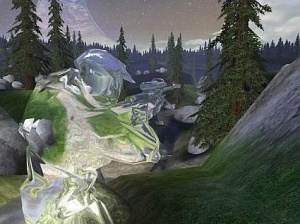 Apart from being a superb shooter, Half-Life was a visual experience unlike any I'd discovered in my artistic pursuits. It was fluid, evolving and enveloping. It took me into and through another world. I had no idea game design and technology had come so far, and I was completely hooked. I've since spent the last near-decade as an avid gamer, chasing similar experiences. I've been overjoyed to discover them in all sorts of games, across every platform. My real-life photographic pursuits have fallen by the wayside, but I've turned into a screenshot junkie. I love gaming imagery. I compulsively gather screens as I play games, and I sometimes buy gaming magazines solely for the pictures. I picked up Halo 3 last week. I'm extremely taken by its endlessly customizable multiplayer playground. I'm marginally impressed by the story campaign. But I'm absolutely enthralled by the game's Theater mode, which, as it happens, has reawakened my photographic sensibilities and given me a whole new outlook on the game.